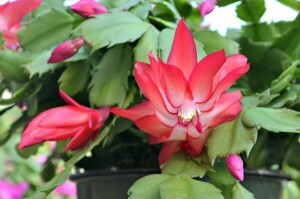 Aside from the ever popular poinsettia, two other holiday “live plant” favorites are the Christmas cactus & cyclamen. Both offer lovely flowers in a variety of colors. While they are traditional holiday favorites, they each have special care requirements that are uniquely their own. 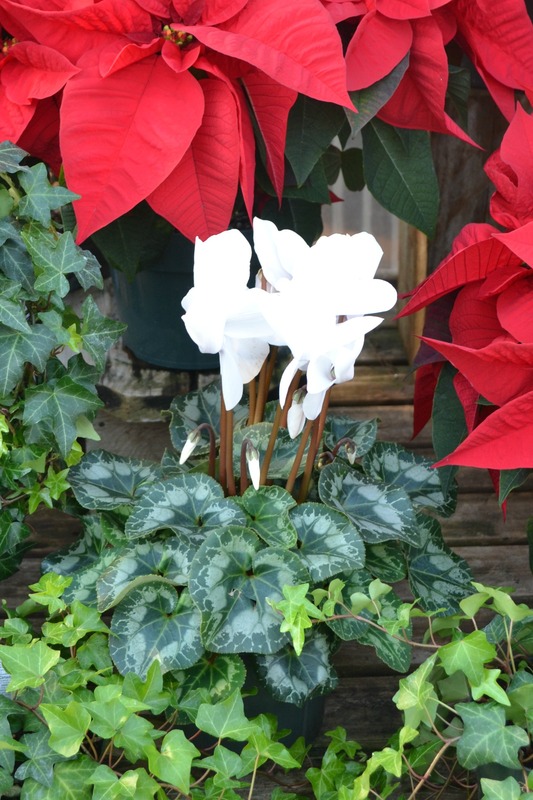 The cyclamen is an ever-popular holiday favorite that has butterfly-like blossoms on slender stems. You can choose from a variety of colors, including white, pinks and reds. You may also choose between variegated, solid or shaded blooms as well as ruffled or smooth edges. The heart-shaped leaves contrast nicely with the flowers as they are a silvery-green to maroon in color. Cyclamen prefer bright light, so placement near an east or south-facing window is ideal. This way, it gets both the bright light it needs during the day as well as the cool temps at night (make sure to keep away from drafts). 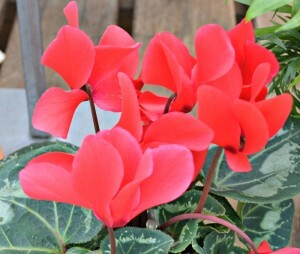 It is important to note that cyclamen can tolerate temps as low as 35 degrees F without damage, though they prefer temps between fifty and seventy degrees F.
placing on a moistened pebble tray. If your cyclamen becomes leggy, move it to an area that has brighter light. After flowering stops, the leaves will die down. Gradually reduce the waterings and let the soil dry out. When all top growth is finished, dig up corm (make sure it is dry) and replant. To prevent crown rot, make sure the corm is halfway out of the potting mix. Water thoroughly and place in an area that is well-lit. Second year cyclamens will have smaller, yet more abundant flowers. The Christmas Cactus is an old fashioned favorite during the holidays that boasts arching and branching stems with flattened segments that are 1-1/2” to 2” in length. It blooms mid-November and late January, producing white, pink, purple or red flowers. The Christmas Cactus prefers medium light. While actively growing, allow 1/4 of the soil to dry before watering again. It is wise to also use a flowering fertilizer to help promote growth. 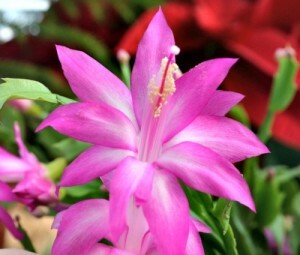 Typically, you can expect your Christmas Cactus to flower for two to three weeks and then go dormant. It is during this much needed dormant period that you must follow specific directions to ensure your Christmas Cactus will flower the following year. Once the dormant stage begins, stop fertilizing and water only enough to prevent the soil from drying out. To encourage flowering, they need 14-16 hours of darkness and cooler temperatures (50 to 65F). These conditions must be met until buds begin to form. At this point, the regular watering and fertilizing schedule may resume. Do not rotate your cactus once buds have formed; doing so will cause them to stretch and drop. If your cactus begins dropping blooms, most likely it is the result of sudden changes in the environment, low humidity levels or improper watering.